Bagels are hands-down one of breakfast’s greatest players. They’re quick and easy, and when freshly-baked from a high-quality bagel shop, are truly delicious. Whether you enjoy them with the classic cream cheese, a little bit of jam, or maybe some Nutella, a good bagel stands up to the morning. Here are the best bagel shops in Oklahoma! Without question, Ingrid’s has some of the best bagels in the state. The garlic-onion-cheddar is a personal favorite, but the blueberry bagels are extra special, too. They’re made on-site, baked fresh every day. Brooklyn-style bagels in a casual environment from sunup to late night. This is a nice coffee shop where you can sit and enjoy a beverage while reading or listening to music. The atmosphere is chic and hip, a cozy spot to spend the day. Just good, traditional New York-style bagels, in a variety of flavors. Locations in Edmond, Tulsa, Norman and Oklahoma City, also. Their menu consists of everything from jalapeno bagels, to French toast bagels, to cranberry-orange-walnut. Try their bacon chive and onion cream cheese! Lu Lu’s brings a taste of Alaska to Lawton, as it’s home bakery is based in Fairbanks. You can create your own bagel sandwiches to go with your coffee. 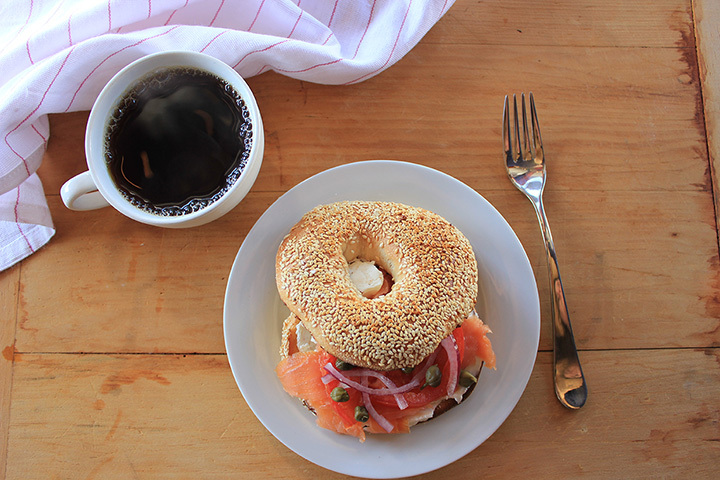 Try the lox bagel with cream cheese, salmon, capers, chives and red onion. It’s to die for! Einstein Bros. has two locations to serve the Tulsa area. It serves Caribou coffee alongside its in-store fresh-baked bagels. Join the Shmear Society to get a free birthday offer and other special treats throughout the year. This urban farm and bakery serves up some seriously delicious bagels. Not only do they make bagels, but they also produce bagel chips, croutons, chocolates, granola, seasoning and spices, and seasonal baked goods. This is as fresh as it gets!